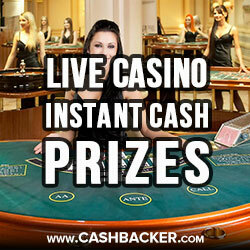 Grosvenor Casino’s Live Casino Host Instant Cash Prizes! Grosvenor Casino just keeps on getting better and better! Not only does their live casino operate 24/7, but they’ve got a host of awesome bonuses available up until the 26th June! Find out more below! So much to get involved with this June! Head on over to the live tables at any time during this month and keep an eye on the chat box. Dealers will be asking random trivia questions during play and if you’re the first to answer you’ll bag an instant cash bonus of up to £20! At random times during the month the dealer will announce the ‘bad beat bonus’ has been activated. During this time, if you’re unlucky enough to lose three games in a row, you’ll be rewarded with a bonus of up to £20! If the dealer announces that the ‘suited 7s’ bonus has been activated and you manage to land three suited 7s on any of the Grosvenor dedicated tables, you’ll bag an instant £50 bonus. Again, keep an eye out on the chat box for notification on when this bonus has started. If the ‘catch the flush’ bonus is announced, then you’re in for a treat. If you manage to land three, four or five cards of the same suite you’ll be rewarded with a £5, £10 or £20 bonus! Random bonus cards will be added to the shoe by the live casino host all month! These bonus cards come in a variety of values and if you’re lucky enough to land one, you’ll bag an instant cash bonus! That’s pretty much all there is to it this month at Grosvenor Casino! Make sure you check out or review of Grosvenor Casino, or why not head on over straight away and take advantage of this jam-packed month of promotions!